With a 65 year history of supporting those in need, Heifer International’s mission is to work with communities to end hunger and poverty and to care for the earth. So it was a great pleasure that URETEK ICR Mid-South was able to provide an eco-friendly solution to Heifer’s concrete lifting and soil stabilization needs. The Heifer International building was commissioned in 2002 and completed in February 2006. It was the first PlatinumLEED (Leadership in Energy and Environmental Design) certified building in Arkansas and the only one is the South-Central US. There are less than 50 LEED certified buildings in the entire country. The building site started with an old rail yard site known as “Brown-field” and construction 75,000 tons of earth from the area and creating wetlands to store, control and reuse the surface groundwater. Abandoned buildings on the property were crushed and reused in the concrete and mortar portions of the building and steel and wood were recycled too. Bamboo was used for flooring since it grows quickly and there is water is a water collection tower integrated into the building that captures runoff from the roof. This water is used in place of municipal water resources to run the building. The building is only 62’ wide at its greatest width which allows all workspaces to benefit from the natural light provided by the sun. The design is optimized to provide heat in the winter and cooling in the summer and for those of you that would like to consider working at Heifer International…wear comfortable shoes because the elevators are very slow, encouraging employees to take the stairs. Abandoned buildings on the property were crushed and reused in the concrete and mortar portions of the building and steel and wood were recycled too. The overall master plan for the new Heifer International Center is a series of concentric rings that expand outward form a central gathering space. The deign is not only practical; it’s also symbolic, representing the “ripple effect” created from Heifer’s unique Passing on the Gift cornerstone. Included in these concentric rings are 8’ wider sidewalk panels that follow the natural curve of the building, and this is where URETEK’s “Simple Solution for Complex Problems” comes in. The sidewalk panels had begun to experience settlement of up to 2” in various areas, creating trip hazards and concerns about the replacement costs for over 1,300 square feet for recycled concrete. While replacing the panels was an option, it wasn’t necessarily the best solution… monetarily or ecologically. URETEK began work at 7:30am and by 5:00pm had supported and realigned ten large concrete panels. The process began with URETEK’s trained technicians drilling a series of dime sized holes through the panels at approximately 4-8’ apart. The dime size holes were then used to inject our patented hydro-insensitive expanding polymers foam beneath the panels where it expanded to stabilize the soils and lift the panels within 1/10” accuracy. During the injection process, URETEK’s patented material reached full expansion within 15 seconds and was traffic ready within 15 minutes. URETEK’s material did not contribute to future settlement problems because it weighs much less than some of the alternative solutions to concrete lifting using injection technology. 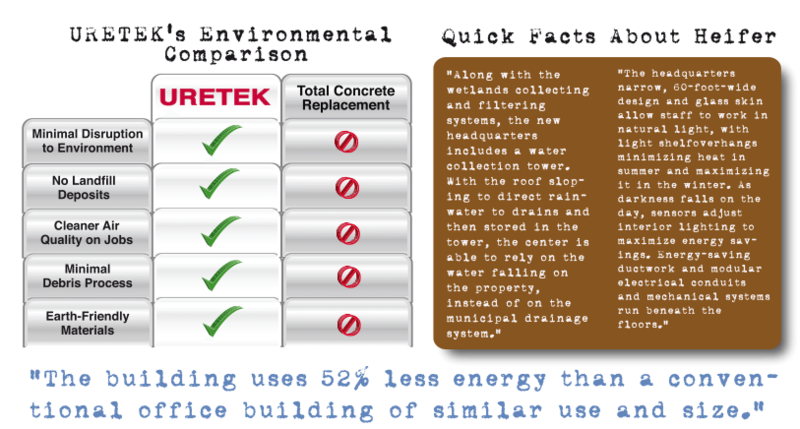 And finally, URETEK’s environmentally neutral material provided an eco-friendly solution to an eco-friendly building! To view a list our Affiliates Click Here! ©2019 ©URETEK ICR. All Rights Reserved.